I’m usually the last one you’d expect to get a boxing post from, but I got home from work this afternoon expecting to turn on an A’s – Orioles game in progress from Baltimore. 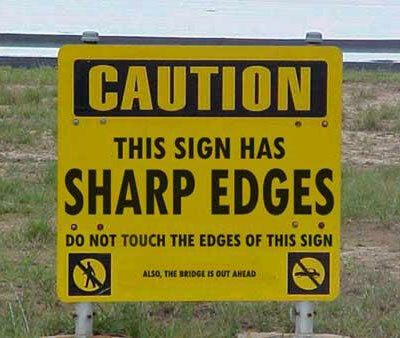 Unfortunately, I was confused – they’re playing out here in California. But FORTUNATELY, the station that airs the game was showing some ten year old boxing. Well wait, that’s not the good part. Usually I’d change it right away, but immediately I recognized Peter McNeeley. Of course I remember him from his infamous fight with Mike Tyson back in 1995, but I was too young to care enough for a pay-per-view fight. I was old enough, though, to know that the fight wasn’t going to end well, and that we’d probably never hear from McNeeley again (if we were lucky). So when I saw him being introduced, I decided to leave the remote where it was. And when I saw his opponent, Henry Akinwande, I turned up the sound and scooted closer to the TV. I could tell McNeeley was in the twilight of his career, but the broadcast looked straight out of the early 90s. Amazingly enough it was 2001, which was probably better for me in the long run, since it meant that he truly was on the decline. Besides the obvious intimidation edge Akinwande had, he had a pretty significant reach advantage as well. 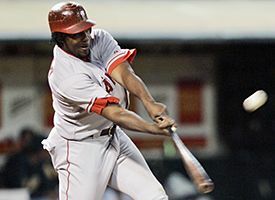 McNeeley came out guns blazing – not necessarily hitting anything – prompting the announcers to pull out the “that’s why they call him Hurricane” line early. I actually thought he was going to stand a chance. But about 30 seconds in, McNeeley was tired, and Akinwande started landing jabs as if they were mere bites of a hamburger. You could actually hear fans laughing in the background as McNeeley took jab after jab to the face. He went to the mat twice in the first round. Neither time the result of a devastating blow, rather a flurry of combos that pretty much scared him into the ground. 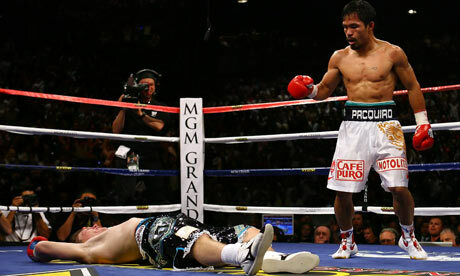 In the second round, I’m almost positive he was out on his feet until he actually was knocked to the ground. This time, it was a bonafied knockout blow, as Akinwande could tell he was pretty much defenseless. Amazingly, this was one of only six times McNeeley was knocked out. On the other hand, he’s now 0-3 in fights I’ve actually heard of. If you like one-sided fights that people post on youtube where you’re sort of cringing the whole time because you know one person has ZERO chance, enjoy this bad boy…. Or, skip to part 2 for the downward spiral…. Wow, two boxing posts within two weeks is easily a record for Doin Work! This one doesn’t really have to do with any current boxers, and is merely a quick review of a documentary that one of my former college roomates made. I was in Santa Barbra over Memorial Day Weekend visiting my college friend, Pat Moyer. I’ve been bugging him to get me a copy of his documentary for a LONG time. And by long time I mean since 2008 when I went to SB to see the movie premier, but finally he remembered to give me a copy. I was impressed with the movie the first time I saw it, and thought he and Ryan Petty did a great job of showing what effects boxing has on people mentally and physically after they hang up the gloves. The second time I saw it I liked it more than the first or maybe it was so long ago that I kinda forgot how good it was. Anyways, long story short, I was able to grab a DVD from him, and after watching it, I thought since we had the blog it was as good as anyplace to get the word out about it. The reason my friend Pat was inspired to make the documentary in the first place was because Denny and Phil Moyer are his grandpa’s brothers. Denny Moyer was the first ever light weight champion, and had a great boxing career. Phil was a little less successful, but was also a good fighter that held his own for quite some time. The documentary shows the ways the brain is damaged, and it takes you through the mentality of different boxers while they are in the ring, and what they are like after they retire. You could even call it a more brutal sport than MMA. There’s nothing crazier than watching Phil and Denny in a clinic walking hand in hand with bike helmets on. Their 90-year old father, Harry Moyer, is much more functional than his sons and tries to see if they remember him, which they seem to but you’re not entirely sure. Harry was their trainer and coach throughout their careers, and still has his head on straight. Phil and Denny were less fortunate, and the power of that footage was crazy. The documentary also follows other boxers, some that are still in the ring, and some retired. If you ever wanted a closer look into boxing without the Hollywood storybook endings like we see in Rocky I-X, this film is perfect for you. The movie also has tons of great boxing footage (aka: devastating knockouts) that any fight fan can appreciate, and to top it off, all of the proceeds that are made from the movie go the the Retired Boxers Foundation. They haven’t had a mass release of the film, because they’ve had trouble finding a solid distributor, but for the moment, you can follow the instructions below and get a copy if you’re interested. The money being donated goes to a great cause, because just like the NFL, nobody takes care of older retired boxers. Go to www.retiredboxers.org and click DONATE (upper left side of website under logo) on the homepage, then enter an amount of $15 or more. If your mailing address if different than the one provided by PayPal, click ‘Add special instructions to the seller’ on the payment confirmation page and enter a new address. They will send you a free private screener right away. All donations are tax-deductable. We would also like to thank everyone for their patience with the film. We are still seeking distribution and hope to continue to build momentum with this project. I’ve had one of those super busy weeks, and neglected the blog a bit. Last night I finally had a chance to watch the Hopkins-Pascal fight that I Tivoed on Monday (thanks for airing it Showtime). Sorry this took me until almost a week after the fight actually took place to write about it. It’s pretty impressive for any 46-year old to be in the ring, let alone a title fight. The Executioner was nothing short of brilliant in the fight, and became the oldest boxer ever to hold a title. He will also be the oldest boxer to have a title defense when he decides to fight again. He’s a genius in the ring as he gets into the head of his opponent as one of the best trash talkers/taunters the ring has ever seen. Was this one of the greatest achievements of all time? I’d argue it is. We see ageless wonders like Jaime Moyer in baseball that somehow keep pitching, but boxing is a much different animal. Hell, you see the best professional athletes try to do boxing workouts and can’t even hang, so that’s got to say something about the sports ability to define athleticism. Fighting is and has always been the best way to tell how athletic any person is. You can’t fake anyone out or flop your way to a victory you have to stand toe to toe with the other man in the ring. Why is this such a great feat when boxing seems to be in a constant state of flux and turmoil constantly losing popularity? I personally think that only the heavyweight ranks have lost their luster. The middleweights are scattered with a few quality boxers. I feel like if the NFL didn’t exist we’d have another good American heavyweight, but instead all those guys play football. Maybe if boxing had a commissioner like MMA does they’d be able to have better fight cards and be more organized. Anyways, back to Hopkins. Pascal might not be the best fighter in the world, and many seem to discount Hopkins achievements simply because they say he’s boring to watch. Others discount him because he hasn’t beaten that many really good fighters throughout his career. Is that his fault that the middleweight division didn’t produce many quality opponents aside from Oscar and Trinidad? He beat everyone that challenged him for 20 straight title defenses. He moved up to the light heavy division, and won there too. Now he’s back on top of the middleweight division. He’s changed his fighting style since his younger days, and is now much more calculated than his early Executioner style. I still can’t get over how a 46-year-old can have more stamina and be more fit than someone 18 years younger. I’m actually more excited for Hopkins next fight than I am for Pacquiao’s next fight. 23 years of dominating the most physical sport you’ll ever come across is no small feat, so when Bernard has his next fight, you should be watching. What’s Next For Pacquiao the Politician? Manny Paquiao IS boxing right now, and what does he get after he plaster’s (pun intended) Margarito’s face to his glove? Ridicule, that he’s ducking black fighters that fight with an American style. Okay, maybe it was only Bernard Hopkins that said that, but it seems like some agree with his comments, so I’ll assume that’s everyone. It’s funny that a guy who is 52-3 over his career, and owns eight belts that he moved up and down through different weight classes to achieve would be ducking anyone. What more do people want from him? The easy answer to that is seeing him fight Floyd Mayweather. While it doesn’t sound likely it will happen anytime soon, I do think it will happen, unless Floyd keeps ducking it. There’s a couple reasons why I feel like it will happen, and I’ll build my theory through this post, so I can prove I was right when it does go down as the biggest grossing fight ever. It’s been reported that Manny has outdone Mike Tyson for PPV sales, which was somewhat of a surprising stat to me, but not shocking. I thought Tyson fought more intriguing opponents than Manny, but it seems that people are paying to see Manny just as much, and I don’t blame them, because I love watching him fight. With a growing crowd latching onto every Manny fight, don’t you think Mayweather will notice that he’s not the top grossing fighter without Manny? I think Mayweather will eventually, and since Manny did accept all the terms that Mayweather’s camp requested during the last stale mate, there’s no questioning that Manny wants the fight to happen. Mayweather might hate Bob Arum, but really, who doesn’t? Hopefully he can realize that it’s bigger than Arum, it’s about finding out who is the best, and making a boat load of money. Now that Manny says he only has three fights/three years left in him (which is understandable), because you don’t want to be in a political office and have your brain turning to mush while making decisions that affect a lot of your fellow countrymen. I honestly have no idea who he will pick for his next opponent, but can guarantee he won’t be fighting Mayweather with the first of his supposed final three fights. My theory is that they don’t fight until Manny’s last fight of his career. Just imagine the kind of money that would pull in. It realistically could be the top grossing fight ever! Another scenario I’ve been kicking around is Manny doesn’t fight Mayweather in his next three fights, and then retires. A couple of months later he comes out of retirement just to fight Mayweather for something to the tune of $200-$300M. How could you pass that up? Boxing is a corrupt sport, and its only fitting Manny is a politician. Politician’s make calculated decisions, and this theory feels like a great decision to me. I won’t be one of the people purchasing the Pacquiao vs. Clottey on PPV this Saturday the 13th, mainly due to the ridiculous price of the event, and paying for a fight that could be over about as fast as it started isn’t appealing either. 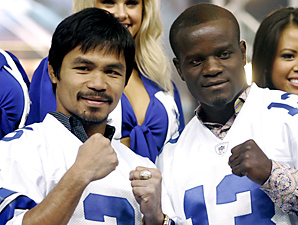 It should no doubt be Manny and Floyd squaring off, but unfortunately that’s not the case. I probably won’t buy another fight until that match up happens, but who knows if it will ever happen. What if one of them loses!?! Would that make it impossible for the match up to happen!?! I’m sure I’ll catch Pacquiao and Clottey on HBO when that’s released. I’ve always liked boxing since one of my old roommates got me into it. His grandpa was none other than Denny Moyer. These days the sport isn’t what it used to be. I wish MMA never came around. I think that took a lot of true warriors out of the boxing pool. If Manny loses this fight it, would be as big of an upset as Buster Douglass over Iron Mike. I wouldn’t hold my breath though. Here’s my list of reasons why Manny will destroy Clottey this Saturday. Hand speed – Manny has the quickest hands of any fighter I can remember. Clottey has never seen anyone close to the speed of Manny, and will struggle against it. The only way to slow down speed is to go to the body, or get him on his heals early, and I wouldn’t count on either of those two scenarios. Work Rate – Clottey has been known in the past for taking periods of time or even a complete round off during fights. Pacquiao on the other hand never seems to take a second off. He’s always attacking, and if for some reason Clottey decides to take a round off, he may not ever catch up on the scorecards. Pacquiao will surely take advantage of any lapses in Clottey’s attack. 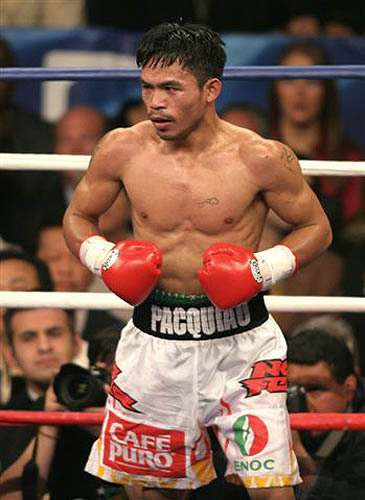 Chin – Pacquiao had a questionable chin when he broke onto the scene. He hasn’t been knocked out since 1999, so those rumors have been put to rest facing sizable opponents like the last man he fought Miguel Cotto. If Clottey is counting on attacking the chin, he might need to rethink his strategy. Power – Manny is the smaller of the two, but packs the bigger punch. Manny has 38 KO’s in his 50 wins. Clottey only has 20 KO’s of his 35 wins. Clottey has never knocked out a top tier fighter, while Manny has knocked out three guys that had never been knocked out before (Jorge Solis, Erik Morales, and Marco Antonio Barrera). Big Fight Experience – This is by far the biggest stage that Clottey has ever seen. Pacquiao has been there tons of times, and with nearly everybody in the boxing world watching he usually destroys the lesser opponent. I’m probably beating a dead horse with this post, since most don’t really belive Clottey has a shot, but I’ve never really written anything about boxing since we’ve had the blog going, so I thought I’d see how it went… All in all it’s pretty improbable to see any kind of upset. Manny is flat out the better fighter, and in reality, is the best fighter on the planet right now. I guess we can’t be 100% sure of that until he and Mayweather stop squabbling about blood testing, and get in the ring, but if Mosely beats Mayweather on May 1st we may never get the chance to see it. This week’s RFP isn’t technically a “player” of anything, but he’s still a notable sports figure of the 90s. Not quite cut out for boxing, the 5’11”, 415 pound Butterbean found his niche fighting in the Toughman circuit, where he compiled a 56-5 career record. He also dabbled in boxing a little bit, most notably when he fought, and lost to, Larry Holmes in 2002. Somehow he still managed to rack up 77 wins to go with 7 losses and 4 draws. He even had a son, Babybean, who became a boxer. Last October, he announced his retirement from boxing, but continues to fight in mixed martial arts circuits. 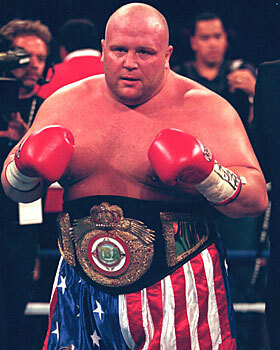 These days, Butterbean is residing in Jasper, Alabama, where he owns his own restaurant, Mr. Bean BBQ. I don’t know why, but this recent Oprah interview with the infamous duo of Holyfield and Tyson gets me laughing for some reason. Why is this ear biting relevant in the first place? It happened a decade ago, and you figure Holyfield has fogave and forgot by now. I guess not since he was the one that called this meeting with Oprah… I doubt Tyson thinks at all, so you know this hasn’t been a burning issue on his mind, until someone else (Holyfield) brought it up. I guess Holyfield’s child support checks are adding up quickly, so he figured Mike wouldn’t mind jumping into the news a little to possibly raise a few $$! I wonder if Iron Mike even knows he looks like a five year old on camera. It was laughably similar to Jim Zorn’s apology for the Redskins offensive performance! Both were sincere, but you just can’t help but chuckle deep down. Sorry Mike, whatever momentum you gained back by being in The Hangover, you abruptly ended that for me with this interview. What the hell is it with boxers and the pre fight stare down, followed one of them going in for the kiss? Holy crap, if I got into a stare down with a dude in a pickup basketball game the last thing on my mind would be trying to kissing the guy! By the way, can we even say the dude threw a punch here? I’m going to call this a savage girly slap. Which might I add, if you can’t take, maybe you should be in a different line of work, you obviously weren’t ready to do real battle.